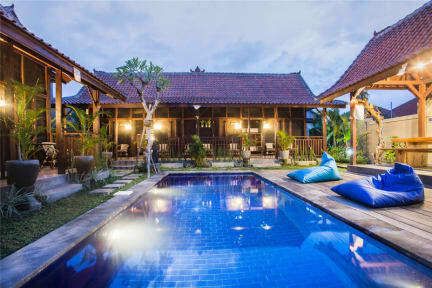 Elements BnB is ideally located in the most central area of Canggu Surf Town. Less than 10 minutes walking to the Nelayan Beach or 15 minutes to the Old Mans Surf Camp. Motor Bike is the easiest way to explore within the area and rental is available onsite. We invite our fellow travelers to relax in our crystal clear pool, enjoy beverage with your friends from our mini bar, or surf our fast and free internet. Such as comfortable KingKoil mattresses, clean pillow cases and bed linen, daily housekeeping, Free Towel with deposit, Free Coffee & Tea, and free continental breakfast. Very clean, great beds, social but not too much party. Nice pool and decent breakfast. Had a private room was beautiful and super comfy. Highly recommend. I loved it here! Staff so kind and everything is clean and the rooms are very good also! Really nice place to stay if you just wanna chill. Not a party hostel, but still it's very easy to meet people here. The value for money is great here; pool and terrace are amazing and the place is really clean. Close to the beach and Canggu's main street and you can also rent a scooter at the hostel. Only thing is you can sometimes hear the music from the neighbouring hostel called The Tipsy Gypsy, but that's not a big deal compared to the overall quality of this hostel. Very nice hostel in a great location. 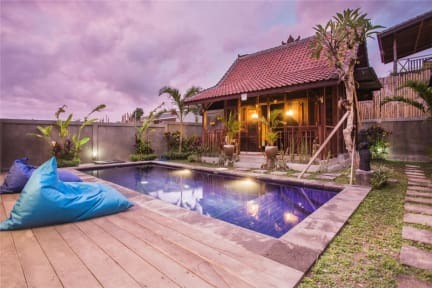 Right in the centre of Canggu and a 10 minute walk to the beach and old mans. 2 minutes from pretty poison too. It's not super social and it's confusing it has 2 parts but we met some really nice people. Breakfast is basic but good to have. Lovely staff. We stayed in a private room right next to the swimming pool which was lovely. The bed was comfy and the room was nice, however the air con was a bit temperamental. Staff were friendly and helped us find a place to hire scooters and get our laundry washed. Location is a little bit of a walk to the beach, but takes less than 5 minutes on a scooter! The hostel layout itself is nice with cabin style dorms with a pool in the centre however inside the dorms is another story. A couple of friends and I stayed for a few nights and came across several bed buds that left 18 bites on one arm alone. When we told the staff they didn’t seem to care and appeared like they already knew of the problem. Bed bugs. When you just want to sleep, bed bugs is the worst. I think is something normal for the staff. At least they offered me to give me my money back. There were bed bugs in my bed (found 5 of them within 15 mins). The staff was not really that surprised. They didn't offer me another option and let me look for another hostel in the middle of the night. As I was back there on the next day to finalize the cancellation, they seemed to have not informed the rest of the people in the room. I would definitely not recommend this place to anyone unless you are looking for new pets back home.